Kohei Saito is a visiting scholar at UC-Santa Barbara and a Japan Society for the Promotion of Science postdoctoral fellow. 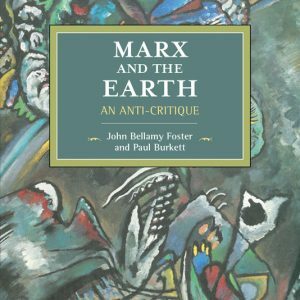 John Bellamy Foster and Paul Burkett, Marx and the Earth: An Anti-Critique (Chicago: Haymarket, forthcoming in January 2017), 316 pages, $28, paperback; hardback—Boston: Brill, 2016, $149. 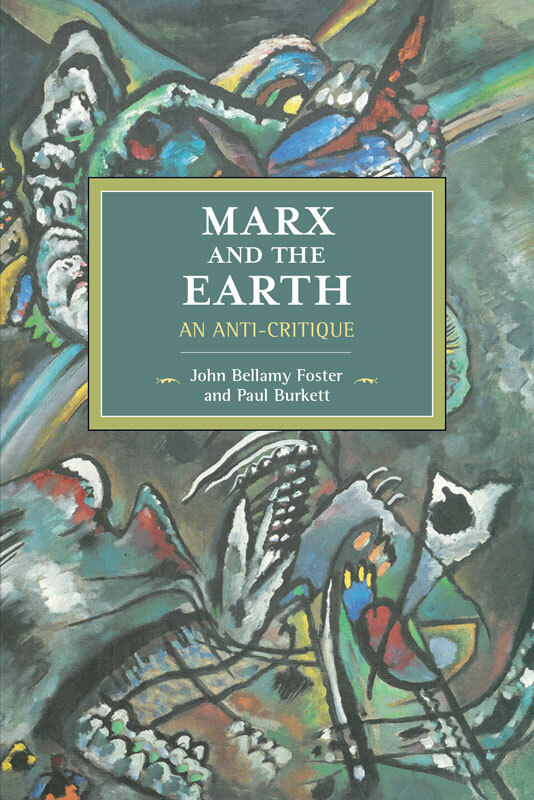 In his recent foreword to the second edition of Paul Burkett’s Marx and Nature, John Bellamy Foster reflected on a significant change in left attitudes toward Marx’s ecology: “Today Marx’s understanding of the ecological problem is being studied in universities worldwide and is inspiring ecological actions around the globe.”1 This worldwide recognition of Marx’s ecological critique of capitalism without doubt owes much to Burkett’s Marx and Nature (1999) and Foster’s Marx’s Ecology (2000). Yet the new interest in ecological Marxism did not originate solely with these books. Rather, as their new co-authored book Marx and the Earth documents, over the last fifteen years Burkett and Foster have meticulously refuted the many criticisms of Marx from so-called “first-stage ecosocialists,” such as John Clark, Joel Kovel, and Danuel Tanuro. Their criticisms are diverse, and each is given close scrutiny in the chapters of Foster and Burkett’s book, which discuss “Marx’s dismissal of the intrinsic value of nature” (Introduction); “instrumentalization of nature as man’s inorganic body” (chapter one); “Marx’s and Engels’ ignorance about thermodynamics” (chapters two, three and four); and “downplaying of natural conditions in reproduction schemes” (chapter five). It should be noted that, whatever their disagreements with Marx, the first-stage ecosocialists were also deeply critical of capitalism. So why are Foster and Burkett arguing with their potential comrades? Furthermore, some of the issues taken up in Marx and the Earth might appear abstruse at first glance—why bother debating them at such length? However, a patient reader will soon recognize the book’s importance and the significance of the issues at stake. As the authors point out, the “first-stage ecosocialists,” despite their avowed appreciation of Marx’s larger legacy, tend to emphasize the theoretical shortcomings of Marx’s ecology in the strongest terms, as “a major ecological flaw,” “a serious error,” “a defect,” and “a failure” (16). They prefer to abandon Marx’s theories of value, reification, and class altogether, dismissing them as outdated and irrelevant, and see no point in reviving Marx’s ideas as part of a radical critique of capitalism’s environmental destruction. At the same time, confronted with the growing hegemonic influence of a more “classical approach” to Marx and Engels, the first-stage ecosocialists search single-mindedly for any “flaws” in Marx’s and Engels’ understanding of natural sciences, however trivial, in order to undermine Marx’s ecology. Foster and Burkett set out to elaborate a rigorous “anti-critique” against those criticisms, in order to finally settle these debates and defend a vital part of Marx’s intellectual legacy. Marx and Engels, of course, could hardly predict everything that has befallen humanity and the environment since their time. However, for too many critics on the left, this obvious fact alone invalidates their writings on ecology. Instead, drawing on the rich socialist and ecological tradition of Paul Sweezy, Shigeto Tsuru, István Mészáros, and Barry Commoner, who had already argued for the theoretical relevance of Marx’s ecological critique in the 1960s and ’70s, Foster and Burkett convincingly demonstrate that Marx’s ecology can allow us to derive a “methodological approach applicable to the quite different (but not unrelated) environmental problems of today,” because his critique of political economy, more than a century on, still offers unique insight into the fundamental logic and structure of capitalism (24). In making their case for the “compatibility” of Marx’s view with contemporary ecological economics, Foster and Burkett undertake historical investigations of the scientific discourses and debates of the nineteenth century (135). For example, they provide translations of the Italian and German versions of Sergei Podolinsky’s seminal article on “Socialism and the Unity of Physical Forces,” from the early 1880s, in the appendix, making it clear that Marx and Engels did not reject Podolinsky because they were ignorant of the latter’s thermodynamic contribution to ecological economics, but rather because they were fully aware of Podolinsky’s problematic presuppositions. Podolinsky’s crude materialism, based on “energy reductionism,” is of little use in understanding the social category of “value.” In other words, a thermodynamic perspective alone is not able to reveal the historical specificity of capitalist social relations. Even within thermodynamics, Podolinsky’s calculations, according to Burkett and Foster, are deeply flawed, ignoring the energy inputs associated with fertilizers and coal, and effectively omitting humanity’s role as a “squanderer” of accumulated solar power in the production process. Marx and Engels, by contrast, gave far more attention to such waste, opening up the possibility of an ecological critique of value (127). Furthermore, Foster and Burkett show that Marx and Engels eagerly and carefully studied the newest developments in the natural sciences, and first-stage ecosocialists’ critiques of Marx’s ignorance of thermodynamics, among other areas, are based on arbitrary or superficial reading of the texts. Though Engels is better known for his writings on natural science, the book offers a valuable reminder that Marx was an equally keen student of many of the same subjects. The intellectual division of labor between Marx and Engels suggested by Western Marxism, one inherited by first-stage ecosocialists, therefore does not hold. Western Marxists, most influentially those associated with the Frankfurt School, limited the application of dialectics to society, excluding what they viewed as Engels’s misguided project of a “dialectics of nature,” in an effort to save Marx from the rigidly positivistic and mechanistic worldview of Soviet Marxism. The price they paid for this intellectual foreclosure was significant. By excluding natural science from Marx’s project, Western Marxists were left unable to analyze modern ecological crises as manifestations of the basic contradictions of capitalism. So Alain Badiou, a contemporary representative of the Western Marxist legacy, ironically declared that ecology is “a contemporary form of the opium of the people.”2 Against this tendency, Foster and Burkett’s Marx and the Earth overcomes the binary of society and nature within Marxism, successfully demonstrating that Marx was able to elaborate his conceptions of “labor power” and “value” without contradicting or distorting the natural scientific discoveries of his time. The key concept in this transcendence of the society-nature binary is “metabolism” (Stoffwechsel). According to Marx, labor is a mediation of the metabolic interaction between human beings and nature. Humans actively work upon nature in a conscious and teleological manner, dramatically altering and disrupting nature. At the same time, humans, as a part of nature, are not in a position arbitrarily to manipulate the external, sensuous world. Rather, they depend deeply on their environment. This reliance on nature is apparent in the limited availability of natural resources and energies, and in the myriad ways in which the development of human societies has been conditioned by geological, climatic, and biological factors—what the authors call the “reality of coevolution” through the incessant process of the metabolic interaction between humans and nature (116). In this sense, Marx’s concept of “metabolism” starts with the recognition of this transhistorical “unity” of humans and nature as a fundamental material condition. On its own, the concept of metabolism is hardly revelatory. But Marx goes further, aiming to understand the historical specificity of the metabolic relationship between humanity and nature under capitalism. This is why Foster and Burkett stress that capitalist production is characterized by the “separation” of humans from their objective condition of production, i.e., by alienation from nature (85). Instead of falling into a neo-Malthusian vision of overpopulation, Marx asked how capitalism’s historically unique organization of the metabolism between humanity and nature causes “rifts” in material conditions of life. Of course, capitalist production is not possible without support from nature, and even its rapacious growth is constrained by the material limits of available resources. However, capital’s endless drive for self-valorization means that it cannot fully consider the sustainability of historically accumulated energy and resources such as soil fertility and fossil fuel. Consequently, the “rift” noted above takes the form of the environmental crises that accompany the expansion of capital’s logic around the world. In this way, Marx and the Earth already prepares a cogent reply to Jason W. Moore, who has recently argued that “the metabolic rift” presupposes a crude “Cartesian divide” between society and nature.3 Such dualism is actually alien to the concept of metabolism, however, while the opposite approach, a one-sided emphasis on the unity of society and nature, elides Marx’s vital insight that capitalist production is characterized by the alienation of labor from nature. The social form of labor is of central importance to Marx’s critical investigation, and to treat labor, as Moore does, as merely one of what he calls the “Four Cheaps” enabling capitalist expansion, is to miss this fundamental point of Marx’s theory of metabolism. Marx and the Earth is a thorough examination and defense of Marx’s ecological critique of capitalism, and its ideas have been further bolstered by the publication of the new edition of Marx and Engels’s collected works, the Marx-Engels-Gesamtausgabe (MEGA). A number of Marx’s notebooks, unpublished until the new edition, record his careful examination of the newest advances in natural science. Two specific examples show the MEGA’s relevance to Marx and the Earth. These remarks will come as a surprise to those who wish to denounce Marx as a naïve, anthropocentric apologist for technological development. His notebooks instead document his real reaction against the capitalist form of “robbery” development, a critique that hardly excluded non-humans from consideration. In any case, Foster and Burkett are the best representatives of the “second-stage ecosocialists” who have revived the Marxist tradition of ecological critique of capitalism. It is no wonder that their careful analyses in Marx and the Earth and in earlier works have inspired many scholars and activists, and that a movement of “third-stage ecosocialists,” such as Naomi Klein, Stefano Longo, Brett Clark, Del Weston, and Richard York, is emerging (11). More than just an “anti-critique,” Marx and the Earth positively shows that the classical approach to Marx provides a methodological foundation for understanding the current global ecological crises of capitalism. ↩John Bellamy Foster, “Foreword,” in Paul Burkett, Marx and Nature: A Red and Green Perspective (Chicago: Haymarket, 2014), vii. ↩Alain Badiou, Live Theory (New York: Continuum, 2008), 139. ↩Jason W. Moore, Capitalism in the Web of Life (London: Verso, 2014), 76. ↩Marx-Engels Archive (MEA), International Institute of Social History, Sign. B. 106, 209. ↩MEA, Sign. B. 106, 336. ↩MEGA IV/26, 233, emphasis in original.